Blind Cliff Cave is a cave southwest of Karthwasten along the banks of the Karth River containing Forsworn. It contains two zones: Blind Cliff Cave and Blind Cliff Bastion. You will normally enter the cave via the ground-level entrance. Beyond the entrance is a very narrow gorge running to the northwest, with a Forsworn standing in an oil slick ahead. Hanging above are several oil lanterns, with an iron ore vein on the right wall nearby. Ahead is a shallowly flooded tunnel heading northwest. As it rises, it opens out into a huge cavern with part of the ceiling having collapsed letting in the natural daylight or nightlight above a tower to the north. During the day this cavern is fairly well lit because of it, with vegetation including many hanging mosses, red, blue and purple mountain flowers and trees all around. There are three more iron ore veins in front of you, one on the ground to the right, one on the ground ahead and the other on the east wall. (Mining these doesn't seem to alert any of the forsworn in the cavern), however any fighting is likely to alert several forsworn in the area as they are within ear-shot if not sight of each other. This can cause you to be fighting several melee and archers at the same time. 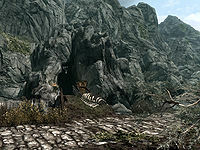 The path bends to the west around a large rock, at this point, to the north, on a rock above you is a lit brazier and Forsworn on a stool with a random potion, a random poison, a small coin purse and a random set of armor. The path continues to the west and leads to a flight of wooden stairs, which is to the right of a dome-shaped stone hut containing an urn and burial urn. The stairs lead up to a landing covered with an oil slick and more oil lanterns hanging above. There are another two iron ore vein on the wall to the left, with a wooden ramp leading higher to the northeast. At the top, a ramp leads up past a doorway in a toppled tower, up to a second doorway where there is an unlocked chest with a copy of the Light Armor skill book The Refugees laying beside it. Descending back to the first opening there are a few food barrels jumbled together at the bottom, with the tower leaning at a steep angle to the east. Someone has added wooden beams to enable the wall of the tower to be climbed to the top, where there is a magic-using forsworn hidden in the dark who favors frost magic. From the top it is possible to climb a pair of beams to a third horizontal beam high above. Once at the top there is a gated doorway to the northeast into another typical Nordic tower with stairs leading up to the right to a pair of closed wooden doors that take you into Blind Cliff Towers. Once through the doors, you are in another tower with stairs leading up to a doorway blocked by a lowered gate. By this is an unlocked chest, with the lever to open the gate above and a burial urn and food barrel beside it. Through the door way is outside with a wooden ramp up to the next level, which is empty except for more stairs leading up again. On this level part of the floor is missing but is bridged by a narrow piece of planking. To the north, across the gap is a magic-using forsworn with a Forsworn staff, a random poison and a flawless sapphire in front of what appears to be a giant "dream catcher" against the wall. From this level there is yet another flight of stairs to the top of the tower and a stone bridge to yet another tower to the north. There is a forsworn on the bridge unless you have already dealt with them. Through the doorway into the tower there is an unlocked chest and burial urn on your right beside more stairs up, with a doorway outside and a wooden ramp up again and an iron door in front of you leading to Blind Cliff Bastion. At the top of the ramp is a doorway blocked with a lowered gate that can only be opened from the other side. This is your exit route later. Through the door is a short corridor heading northwest with a second iron door at the end. Upon opening this door you will see Melka, a hagraven trapped inside a cage. Speak with her to learn that this is her tower and that she was caged by her sister, another hagraven named Petra. If you decide to free her, pull the chain next to the cage and she will ask for your help in killing Petra. You can also leave her to her fate (but this risks breaking the quest; see bugs below). There is a corridor heading to the southwest of the cage with an over-turned table and burial urn on the right and two patches of white cap fungus at the corner where the corridor turns to the northwest before climbing a flight of stairs to a gate with three handles in front. The one in the middle opens the gate, the other two activate a poisoned dart trap. If Melka is with you, she will sense that the handle in the middle is the correct one. Through the gate is a corridor heading northeast to another room with a forsworn magic-user, a full set of Forsworn armor, another gate to the northwest with a caged walkway with several swinging blade traps. To the northeast is a concealed door with a handle on the floor in front, which Melka will inform you of if she's with you hides the lever to deactivate the blades. Part way along the caged corridor you will see a tunnel leading to the outside of the cage where there are several ingot, urns and a chest. At the far end are stairs up and around a corner to the northeast as you enter a dimly lit room there is another concealed door to the southeast with the handle to open it to the right. Behind this is a tunnel that takes you to the area previously seen beside the caged corridor. There are a few urns, an unlocked chest, two iron ingots, an ingot of refined moonstone, two quicksilver ingots and a corundum ingot. In the room there is an alchemy lab and on a raised section behind there are a few more mountain flowers and a cooking pot at one end and an open crate containing an iron ingot, an amethyst, a flute and fox pelt beside a pair of barrels containing ingredients and an apothecary's satchel. To the right of the lab is an iron door behind which you will hear mining. Behind the door is a corridor with two quicksilver ore veins being mined by a forsworn with a goat hide on the ground beside them. The corridor has another white cap fungus growing in it, before turning to the southeast and ending at a pair of unlocked wooden doors. Beyond the doors is a room containing Petra, Melka's sister and two forsworn archers. Petra prefers using fire magic while Melka prefers frost magic. The room has another quicksilver ore vein on the floor to the left of the doors with a balcony running along the whole of the left side and rear of the room. There is a flight of wooden stairs leading up at the far end. Petra and the archers will all be on the balcony when you enter. On the balcony against the northeast wall is an unlocked boss-level chest with a wooden door with a bar on this side to the right. This leads to an iron door to the outside. Before exiting, on the balcony along the southeast wall is a lit brazier in a small alcove with a copy of the Illusion skill book Mystery of Talara, Part 4, while to the right is a doorway with a lowered gate blocking it that is raised by a chain to the left giving access to a small room with a hay pile that can be used as a bed on the ground with a couple of hagraven feathers, a leg of goat and a potion of strength also on the floor. Further to the right of along the balcony are three sheaves of wheat and three pine thrush eggs, one of which is in a birds nest. Once the Petra and the two forsworn are dead, talk to Melka who is overjoyed, for the reward of her fireball staff Eye of Melka. Don't forget to loot Petra's body for a copy of the Restoration skill book 2920, Rain's Hand, v4. Take the door outside and jump down into the previously inaccessible area for two more unlocked chests and a couple more urns. Then activate the lever to open the gate. This dungeon is marked as a cave on the map, but contains a hidden fort within and an extensive fort on the outside, higher up the mountain. The upper fort may be accessible without passing the lower cave / fort, by going up the hill from Karthwasten. Certainly the reverse journey is possible. If Melka is killed by Petra, or by the various Forsworn surrounding Petra, then killing Petra will still finish the quest and "Melka's Eye", the fireball staff, can be looted from her corpse. Melka can also be killed by the player (accidentally or deliberately) and looted, although she will not attack you if you actually help her. Petra isn't named when you face her like her sister, just generic "hagraven" is used. If you kill Petra before releasing Melka, the quest The Affairs of Hagravens will be unfinishable (leaving no way to remove it from your journal). You can still obtain Melka's staff however (by attacking and killing her). If you come out of the door to Blind Cliff Cave and enter the base of Blind Cliff Tower, your follower may disappear. ? Have your follower wait inside the cave until you have cleared the tower of enemies, then bring them through the door. This page was last modified on 6 July 2018, at 23:44.